It is never unusual to see armed police officers on the streets of Brussels these days, from heads of state constantly flying in to mull over the Euro crisis to Belgian public sector workers holding a mass rally against austerity, there is always something happening to explain the whir of a distant police siren or a line of riot police outside the European Parliament. But over the last week there has been a particularly high police presence in the Matonge area of the city due to protests against the re-election of Joseph Kabila in the Democratic Republic of Congo (DRC) Presidential election that was held on 26-28 November. 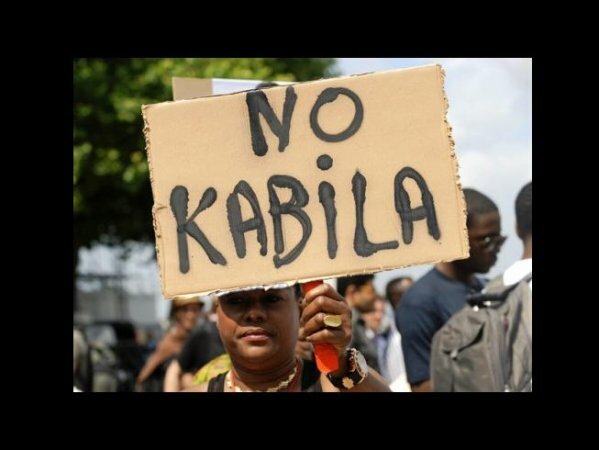 Members of the Congolese community started protesting on Monday 5 December ahead of the election results announcement to show their support for opposition candidate Etienne Tshisekedi. Following the news on Thursday that Joseph Kabila had won 48.97% of the vote and Etienne Tshisekedi 33.3%, the protests continued. Since Monday there have been violent clashes between protesters and police officers. The police have been criticised for their heavy-handed approach, which they claimed was justified because the original protest on Monday had not been authorised by the authorities. 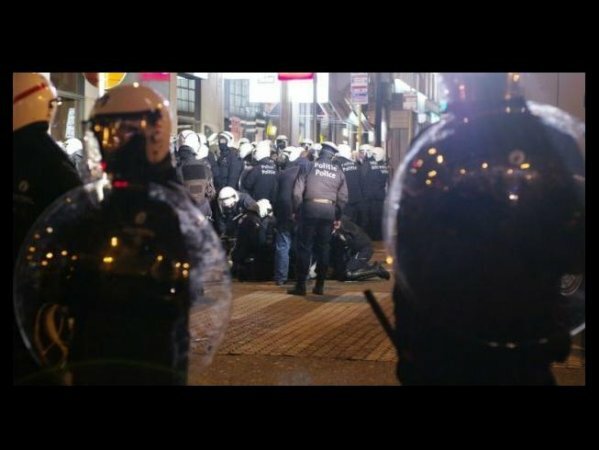 The situation quickly escalated since and the week-long stand-off has resulted in over 500 arrests and 50 official complaints against police violence. But was such a dramatic police response necessary? And in what ways did it contribute to the escalation of violence? Could this not have been prevented by simply leading the peaceful anti-Kabila protesters to a safe place to express their discontent with the election results and the subsequent killings in the DRC capital, Kinshasa? Would there have been as much violence from some of the protestors if the police approach had not been so antagonistic in the first place? Right in the city centre, Matonge is a community in the Ixelles area, named after a suburb in Kinshasa. It has a large Congolese community and, since the 1950s, migrants from all over Africa, from Burundi to Mali to Senegal to Eritrea, as well as hundreds of other nationalities, have also made the area their home. Normally the area is bustling with shoppers on the busy thoroughfares Chausée d’Ixelles and Chausée de Wavre, with their shops and bars selling African foodstuffs, hair salons and restaurants. The area is also popular with many people who work in the European institutions and the many related lobbying and NGO groups situated in the European quarter, as Matonge is located literally a hop skip and a jump from the main concourse of the European Parliament. This mix of cultures and people is why the area is often affectionately described as ‘Africa in Europe’. But while this proximity to the European institutions may have raised the profile of what has been going on here over the past week, the link between the DRC and Brussels really has more to do with Belgium than the European Union. In the mid-late 19th century the Belgian economy boomed and enjoyed the first flourishing successes of capitalism amid the European industrial revolution. And part of this confidence boost came from the huge profits made from exploiting resources of rubber and ivory in the then Independent Congo State, which Belgium’s King Leopold II acquired in 1885 as his private property and governed independently of the Belgian state. This new wealth was invested in grand urban projects such as some of the big boulevards and prestigious buildings that remain part of Brussels’ today. Following criticism from both the Belgian state and other countries due to widespread abuses against the local population, Leopold II handed over the Congo to Belgium in 1908, and it remained a Belgian colony until it gained its independence in 1960. In 2006 Jospeh Kabila came to power in DRC elections that many thought would end the years of instability and civil wars experienced throughout the Zaire period. Instead, widespread human rights abuses have taken place and anyone vocally critical of Kabila risks their life, as Human Rights Watch (HRW) reported. 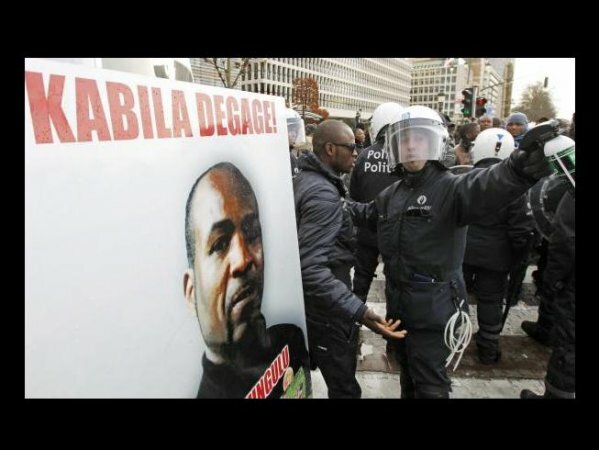 Since the 26-28 November election, HRW has documented how electoral violence has left at least 18 civilians dead and 100 seriously wounded, one of the points that members of the Congolese diaspora in Brussels wanted to get across at their protests in Matonge. However, this message has been lost amid the clashes with the police. The disputed election results and the human rights record the anti-Kabila protesters wanted to highlight is no longer the focus of the discussion. 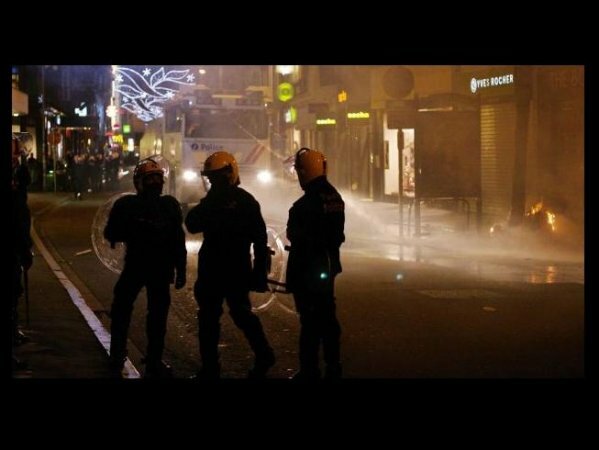 Instead of talking about the legitimacy of the election results, the discussion became about police attitudes towards African communities and violence on the streets of Brussels. This week has seen Molotov cocktails thrown into traffic, numerous car and shop windows smashed, fires burning in the street, and a constant police vigil and roadblock guard the nearby Congolese embassy. Police vans and water pumps and helicopters continue to control the area. It could have so easily gone the other way. Although the original protest was unauthorised, surely policing strategies should aim to protect protesters and lead them to a safe space where they can protest freely? This would also give people a better and less antagonistic view of the police. But perhaps a heavy-handed approach is intended to provoke these kinds of riots make the police look better? The sight of a media whirring with stories of clashes between police and ethnic minority communities perhaps reinforces their sense worth and the idea that there is something to protect people from. The peaceful anti-Kabila protesters should be celebrated for trying to wake-up the population at large to what is happening in a country towards whom Belgium carries a huge historical responsibility. It is unfair to slip into a narrative where we write off all police officers as ‘thugs’, but it is even more difficult to ignore incidents like that of the 29 year old Angolan man who was beaten up by several police officers on Tuesday. The police officers said they thought he was part of the protests when in fact he had simply popped his head out the door of the theatre where he was doing an accounting traineeship to see what all the noise was about. Police officers grabbed him and beat him up despite the fact his colleagues had told them he was working there. He was then held in the police station before being released in the early hours of Wednesday morning. 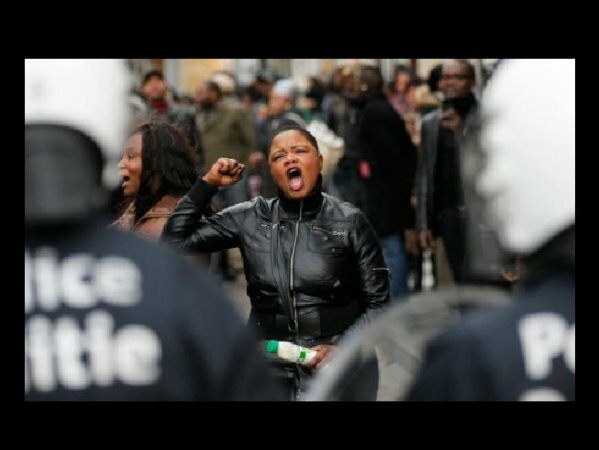 Although the significance of individual behaviour and actions should not be overstated as it is not necessarily representative of systematic trends, problems or characteristics of a whole group, we do need to ask why this violence occurred and look at how complicit the police are in the suppression of the right to assemble. If police worked in communities instead of against them then there would be less violent clashes and we would be talking more about the original messages of the protest instead of how many people were arrested. 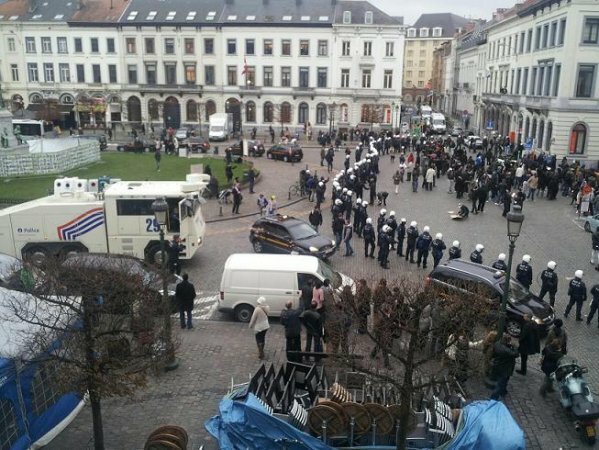 I hope that the Belgian police adopt a more tolerant strategy that respects the right to assembly rather than a provocative one that propagates anger and violence. However the tension that has built up over the last week might prove hard to erase any time soon.